Steven Garrard in Film on 22 April, 2011. In Edo period Japan, rōnin were rather unfortunate figures; samurai, upon losing their masters, were expected to commit seppuku (ritual suicide), proving their loyalty to their dead lords, or, if they were dismissed due to some disagreement, putting an end to their shame. Samurai who refused to do so were known as rōnin, skilled fighters who were only able to find work as bodyguards or mercenaries, unfit to be rehired as samurai. This, however, is not exactly the image that the Western world has of these historical soldiers of fortune. Thanks in part to Akira Kurosawa, the rōnin figure has become blended with the Western idea of the “lone wolf”, thereby establishing an anti-hero archetype: the unwilling but incredibly skilful super-man, who must put aside his selfishness and abandonment of society to help the weak and innocent. The creation of this filmic archetype has an interesting history. Kurosawa, a director censored during wartime for making work considered too “British-American”, was able to incorporate American influences into his post-wartime pictures. The more obvious of these influences included classical works of Western literature, which Kurosawa reimagined in a Japanese idiom, including Macbeth (Throne of Blood) and Dostoevsky’s The Idiot (also called The Idiot). Some of Kurosawa’s more subtle cinematic influences also included American Westerns, particularly those of “auteur” John Ford. In a number of his samurai based Jidaigeki (Japanese period dramas), including Seven Samurai, Yojimbo, and its sequel Sanjuro, Kurosawa incorporates stunning Western influenced visual imagery. For example, in Yojimbo the protagonist Kuwabatake Sanjuro faces off against the gun toting criminal Unusuke in a wide, lonely street, dust blowing between them; they are portrayed as small figures in a large, dirty, frontier town, with the townspeople hiding behind closed doors, evoking the now clichéd notion of pistols at dawn. In all of Kurosawa’s samurai films, the anti-hero faces incredible odds and wins, (even if it is with great casualties, as in Seven Samurai), just as John Wayne manages to fight off innumerable Indians in Ford’s The Searchers. As Kurosawa was influenced by Westerns, in turn his work influenced the genre; Seven Samurai was remade as The Magnificent Seven. Yojimbo remake A Fistful of Dollars has Clint Eastwood take up the role of “The Man with no Name” for the first time in Sergio Leone’s run of “Spaghetti Westerns”; the name of Yojimbo protagonist Kuwabatake Sanjuro translates as “mulberry bush”, a name he makes up before entering the town where the action takes place. The romanticised “lone wolf” character became an archetype during the late sixties in further Western films that were rapidly changing in numerous other ways. 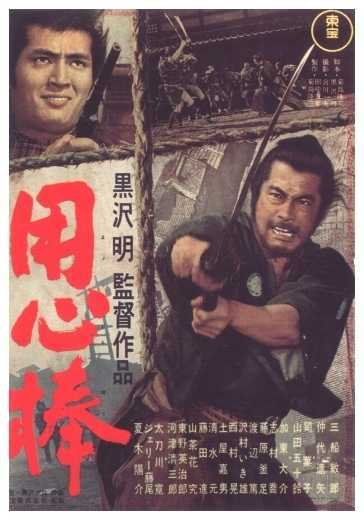 The anti-hero was a character free to go where he pleased, (just as Sanjuro throws a stick up in the air in order to choose his walking direction at the beginning of Yojimbo), and he was more morally ambiguous than the protagonists of earlier, more conventional Westerns, (the run of Westerns starring the rather clean-cut James Stewart spring particularly to mind). This fit in perfectly with the more realistic and less morally explicit films of such directors as Sam Peckinpah and Sergio Leone; Eastwood’s “Man with no Name” while good in relative terms, is still selfish and willing to kill for profit. American Western directors, disillusioned with an America that had just got out of the Korean War and was now a combatant in the Vietnam War, were willing to reassess the idea of the Old West as a place where lawlessness sometimes encroached but was eventually banished, and where Indians were emblematic of chaos and destruction and had to be controlled or destroyed. As a classic symbol of American popular culture, the Western changed in the late sixties to reflect changing attitudes towards America’s self-image. Peckinpah’s The Wild Bunch is particularly violent and disturbing, and seems to represent the death of this positive image and of the quasi-morality play that was enacted in the more traditional Westerns of the Golden Age of Hollywood. It is no wonder that inspiration was found in the works of Kurosawa: a director in some ways enamoured by American culture, but who was also very much aware of the destruction reigned down by America upon Japan during the Second World War; significantly in The Bad Sleep Well, one of Kurosawa’s contemporaneous films, the protagonists reflect on being bombed and the damage done to their lives by the death of loved ones and the loss of their workplace. This “lone wolf” image carries on in Westerns today; the Coen brothers’ recent remake of True Grit features three such figures in the form of the three central protagonists. The most idealistic of these is perhaps Matt Damon’s character, Texas Ranger LaBoeuf, who, while a positive character, is also a figure of ridicule in a role which would have been played as a straightforward and respectable figure of the law in a fifties Western. Kurosawa’s partially invented archetype continues to be a major influence, in and outside the Western, and the idea of the rōnin has changed from being a shameful epithet of a samurai’s lack of loyalty into a rather glamorous concept of a talented but lonely individual.